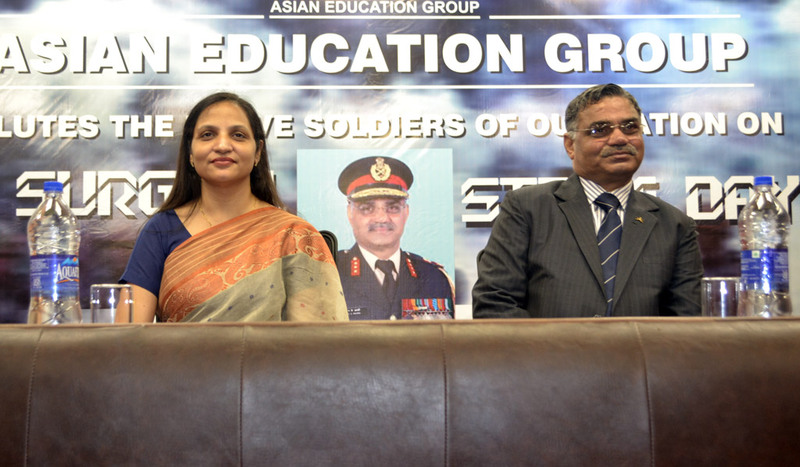 Pursuing the decree issued by the University Grants Commission to observe September 29 as Surgical Strike Day, marking the second anniversary of the Indian Army’s strike against terrorists operating across the Line of Control in Pakistan occupied Kashmir, Asian Education Group organized a guest lecture for its PGDM students. The idea was to commemorate and highlight the valour and sacrifice of the Indian armed forces in general and special forces in particular and encourage students. The Indian armed forces have always brought laurels to the nation. That is why we proudly celebrate Vijay Diwas, Kargil Vijay Diwas and many battle honour days every year. To celebrate Parakram Parv at AEG who better than a soldier of the nation who as a young lad took up the mantle of protecting and guarding his motherland and rose to giddying heights! It was none other than Lt Gen AK Bakshi AVSM,SM,VSM, a highly decorated officer of the Indian army with several military awards given for gallantry and in recognition of distinguished service of an exceptional order . A wonderful speaker, he skillfully painted the absolute plot of the adroitness with which the operation across the border was carried out with surgical preciseness. The nerve tingling narration of the shrewd perspicacious and discerning strategy with the impending dangers , had all ears glued. Students listened with awe and close attention. Such sessions are immensely enjoyed by the students and also create more awareness and national pride in them.